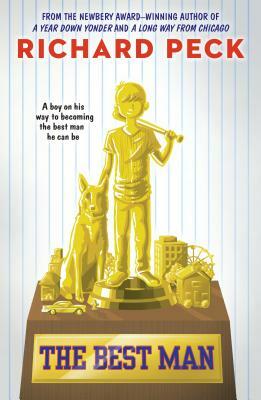 Newbery Medalist Richard Peck tells a story of small-town life, gay marriage, and everyday heroes in this novel for fans of Gary Schmidt and Jack Gantos. Archer Magill has spent a lively five years of grade school with one eye out in search of grown-up role models. Three of the best are his grandpa, the great architect; his dad, the great vintage car customizer,; and his uncle Paul, who is just plain great. These are the three he wants to be. Along the way he finds a fourth—Mr. McLeod, a teacher. In fact, the first male teacher in the history of the school. But now here comes middle school and puberty. Change. Archer wonders how much change has to happen before his voice does. He doesn't see too far ahead, so every day or so a startling revelation breaks over him. Then a really big one when he's the best man at the wedding of two of his role models. But that gets ahead of the story. In pages that ripple with laughter, there's a teardrop here and there. And more than a few insights about the bewildering world of adults, made by a boy on his way to being the best man he can be. RICHARD PECK (1934-2018) was born in Decatur, Illinois and lived in New York City for nearly 50 years. The acclaimed author of 35 novels for children and young adults, he won the Newbery Medal for A Year Down Yonder, a Newbery Honor for A Long Way from Chicago, the Scott O’Dell Award for The River Between Us, the Edgar Allen Poe Award for Are You in the House Alone?, a Boston Globe-Horn BookAward Honor for The Best Man, and the Christopher Medal for The Teacher’s Funeral. He was the first children’s author ever to have been awarded a National Humanities Medal, and was twice a National Book Award Finalist.